Father Richard Rohr believes in the flow. Sometimes it’s Flow with a capital F, sometimes it’s “the Divine Flow.” Sometimes it’s “the flow who flows through everything, without exception, and who has done so since the beginning.” But with more than 150 occurrences of the word “flow” in his new book, The Divine Dance: The Trinity and Your Transformation (Whitaker House, 2016), it’s always the flow that Rohr is pushing, praising, and preaching. The flow is a self-giving exchange of love and life. If you were to ask Rohr whether the flow is primarily something about God, the world, or the human person, he would no doubt answer with an enthusiastic “Yes!” and his twinkling Franciscan eyes would twinkle Franciscanly. The flow overflows the distinction between the Creator and the creature. It flows from God as God empties Godself; it circulates among creatures and binds them together with each other and the absolute; it flows back to God, enriching and delighting that Holy Source who loves to see finite spirits awaken to their true, divine selves. The flow sounds like a noun, but it’s really a verb. Flow verbs all nouns as they flow with its flowing. And everybody is flowing, if they would just realize it; the book is dedicated “to all the unsuspecting folks who do not know they are already within the Divine Flow.” The flow is divine and cosmic and human all at once, always together. For Rohr, that’s the point. What does any of this have to do with the Trinity? Well you may ask. Rohr is a bestselling author who enjoys great popularity on the spirituality scene. He has Oprah cred, a Bono blurb, and an alternative school in Albuquerque. He’s written a lot of other books (he refers helpfully to several of them in the footnotes of this one), and I have to admit I haven’t yet read any of them. I picked up The Divine Dance because it says it’s about the Trinity, and also because it seems likely to be influential in coming months. The book is endorsed by Shane Claiborne, Jim Wallis, Nadia Bolz-Weber, and Rob Bell. Weeks before it was even published, The Divine Dance was already the bestselling new release on the Trinity—indeed, the top seller in Amazon’s listing of newly released theology books, period. Father Richard Rohr, in other words, has a thing going on. He has a signature style, a devoted fan base, and a certain something people expect him to bring to whatever topic he takes up. In The Divine Dance he takes up the Trinity. Except he doesn’t. 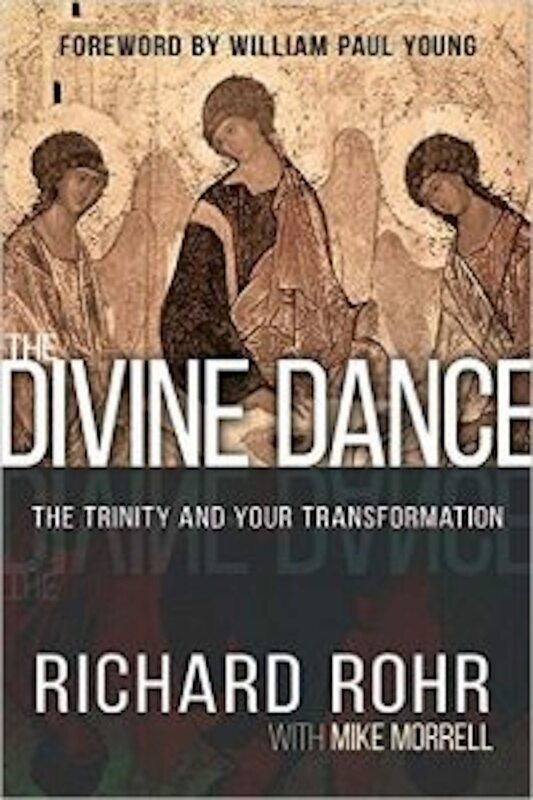 This book, The Divine Dance, is not about the Trinity. What it’s about is the flow (see first paragraph above). What Rohr does in this book is teach about the Divine Flow, and he gets his message across by pressing into service some bits and pieces of Christian theological terminology. If that sounds perniciously subversive to you, there’s a reason. It’s perniciously subversive. In The Divine Dance, Rohr aggressively misappropriates Trinitarian language in order to commend his own eclectic spiritual teaching. Rohr aggressively misappropriates Trinitarian language in order to commend his own eclectic spiritual teaching. God is not just a dancer; God is the dance itself. Now hold on to this. This is not some new, trendy theology from America. This is about as traditional as you get. Whitaker House. 224 pages. $23.99. As evidence that what he teaches is deeply traditional, Rohr claims that “the early Fathers of the church dared to call [the Trinity] a divine circle dance,” using the Greek word “perichoresis, the origin of our word choreography.” There are two or three factual errors here, but never mind that for now.1 The important question, for Rohr and his readers, isn’t whether he speaks responsibly when he’s making historical claims (I would say no), or even whether he’s right that his doctrine is old-fashioned rather than newfangled (also no). The important thing is he gets himself into a position to teach his metaphysic of flow, under the banner of teaching a Christian doctrine. The all-important thing is that the Three are formed and identified by the outpouring and uninhibited flow itself. The flow forms and protects the Three, and the Three distribute the flow. It’s precisely this same dynamic for a healthy society, isn’t it? What is bigger than the Trinity? What’s more primal, more comprehensive, more fundamental, grounding all its goodness and charging it with life? What larger reality gives shape to the Father, Son, and Holy Spirit, making them what they are, preserving them and uniting them indissolubly not only to each other but also to the created world? In Christian doctrine, questions like this suggest severe disorientation on the part of the questioner, and the answer is “absolutely nothing.” In The Divine Dance, however, there’s a different answer. In, with, and under the three persons there is a matrix of relationality, in which the three persons are merely nodal points around which spiritual force coalesces. Focus on that, Rohr says. But you know what I believe? I think the spaces in between the members of the Trinity are unmistakably feminine. The forms or manifestations strike me as the masculine dimension, and the diffused, intuitive, mysterious, and wonderful unconscious in-between, that’s the feminine. And that’s where the essential power is—the space between the persons more than the persons individually. Ignore, if you can, the goddess worship; that’s just a garden-variety error anybody can spot. Ignore also, if you can, the Gnostic-Jungian presuppositions required to identify a “diffused, intuitive, mysterious, and wonderful unconscious” with archetypal femininity; that’s just the coin of the realm in Boomer-era pop spirituality from the Southwest. Ignore, if you can, the view of Scripture that permits readers to sit in judgment over the Bible’s unacceptable language and cultural backwardness; that’s just the settled opinion of liberal theology at large. Those are all distractions. What you have to notice is that this book that claims to be about the Trinity is relentlessly committed to averting your focus from the Father, Son, and Holy Spirit. What you have to notice is that this book that claims to be about the Trinity is relentlessly committed to averting your focus from the Father, Son, and Holy Spirit. The Divine Dance relativizes the three persons of the Trinity. They’re not even islands in a larger stream; they’re swirling patterns in an ocean of relationality. Once you accept this premise, Rohr invites you to receive the next insight: there’s room in the ocean for more swirling patterns. The flow can accommodate a fourth. It must. To make this point as strikingly as possible, Rohr takes a bad risk. The dominant visual image in this book is Andrei Rublev’s 1425 icon of the Trinity (mystically signified by the three men who visited Abraham in Genesis 18). The painting is on the cover, in full color on both endpapers, and also about a dozen times on interior pages. Rohr describes the way the three figures, seated around a table and turned toward the viewer, seem to make the spectator a kind of participant in their shared space. That’s a good observation, well worth meditating on, and one that has been made often before. Some mystics who were on real journeys of prayer took this message to its consistent conclusion: creation is thus “the fourth person of the Blessed Trinity”! Once more, the divine dance isn’t a closed circle—we’re all invited! Sure, this may sound like heresy—especially to a contracted heart that wants to go it alone. But this is the fourth place pictured and reserved as a mirror in Andrei Rublev’s 15th-century icon of the Trinity. This book not about the Trinity tries hard to be, at least, about threeness at this point. When Rohr talks about our inclusion in the Trinity, he uses a kind of simple numerology. He names as his metaphysical principle the notion that “the interweaving of the three [always] produces a fourth on another level.” One is lonely, two is competitive, but three is dynamic and transcendent. Three gets you four. Three gets you included in God. In the opening pages of The Divine Dance, Rohr laments that the doctrine of the Trinity has gone missing in action from the modern church. He’s engaged in “dusting off a daring doctrine.” An awful lot of Trinity books start this way, unfortunately, and many of them promise a cure for that “Trinity Deficit Disorder” (Rohr’s nice phrase) that’s supposedly widespread in the church. But if you’re going to tell a story like that, a lot depends on the details: When was the doctrine functional? When did it go dysfunctional? When was it revived? Though I’d recommend abandoning this fall-and-rise habit of talking altogether, I’m at least willing to believe a version of the story that says Christians temporarily lost touch with the vitality of the doctrine somewhere around 1880 or so: high modernity was tough on the faith. But Rohr has a different story in mind. In his version of “Honey I Shrunk the Trinity,” the doctrine was pretty much dormant “until William Paul Young wrote his worldwide bestselling novel, The Shack, in the past decade. For the first time since fourth-century Cappadocia, the Trinity actually became an inspired subject of conversation and rather pleasant questioning in homes and restaurants. And it continues!” So our dates are AD 381 to 2007, and the hero is Young (who returns the compliment in a fulsome foreword). That’s a lot of dust to dust off a daring doctrine! Rohr himself voices astonishment: “Seventeen centuries of being missing in action—how could this have been true?” Indeed, it strains credulity. So let’s just admit it’s not credible. You can only believe that Rohr has rediscovered the Trinity if you’re willing to believe that this alien content he gives the doctrine is the real truth, and that Augustine, John of Damascus, Aquinas, Bonaventure, Calvin, Wesley, and Barth were just fiddling around with side projects (“Aquinas almost had it,” Rohr concedes in a spasm of generosity). Those benighted souls (well, some of them probably had “contracted hearts that want to go it alone”), along with all the pastors and preachers and faithful women and men through most of the centuries of the church’s pilgrimage: what they were trying to say all along, but never getting right until The Shack, was that in the beginning was the Flow. [M]y long . . . review has one main point: it’s that The Divine Dance isn’t about the Father, Son, and Holy Spirit. . . . [It is] a piece of false teaching in the church. What was the epochal moment when Rohr broke through to the meaning of Trinity as Flow? He was on a Lenten retreat at a hermitage in Arizona. He hadn’t planned to do any reading outside of the Bible, but there in the retreat center was Catherine Mowry LaCugna’s influential book God for Us: The Trinity and the Christian Life. He began to read it, knowing it was “heavy and often boring,” but all the while “catching glimpses of understanding” and increasingly “saying ‘Yes, yes!’ to new words and only slightly-captured ideas.” By the time he finished the book, Trinity “was no longer an abstract idea, a doctrine, or a shelved ‘belief’ but almost a phenomenology of my own—and others’—inner experience of God.” This was stirring: “Trinity was not a belief but a very objective way of describing my own deep experience of Transcendence—and what I call here flow!” In fact, as he drove home after this cram session, he “much more consciously enjoyed the flow” and could see that it “was flowing everywhere.” It has certainly flowed everywhere in The Divine Dance. LaCugna’s God for Us is a deeply learned but deeply flawed academic work. It made a splash in 1993 but has not aged well. On his own testimony and on the evidence of The Divine Dance, Rohr understood little of it, retained only the most problematic parts, and channeled the entire experience into his pre-existing metaphysic of Flow. He expressed his insights in a series of recorded talks, which co-author Mike Morrell transcribed and edited into this book. The transition of this material from speech to print is not, stylistically, a happy one. The book is loose, rambly, and repetitive. That works disarmingly in a few devotional passages, but the sloppy and unaccountable tone continues even when Rohr is making claims that require evidence or specification. I mention the book’s unusual origins because it helped me understand why The Divine Dance sounds the way it does. In its background is an impressionistic reading of a fraught theology book, as told through a series of chatty teaching gambits that might just work in the context of a spirituality retreat, woven into a sketchy volume with a lot of frayed assertions and loose ends. What can we say about The Divine Dance? Rohr renders himself hard to critique by constantly tossing in little imaginary conversations in which he’s being critiqued. He quotes 1 John and then says, “If I had said that independently of St. John, many would have called me a lightweight New Ager from California, but I simply share John’s deeply Trinitarian spirituality—in all its implications. This is true Traditionalism.” This does steal the thunder of the reviewer who wants to announce that Rohr’s teaching deviates sharply from the tradition, and precisely in the direction of lightweight New Age stuff from California. A kind of devotional blasphemy is his trademark. Flirtation with heresy is his frisson. He goes out of his way to sound edgy, Buddhist, sciencey, unorthodox. There are occasional sections where I could agree with him, or at least see that he was in touch with something I wanted to learn more about. But these sections inevitably crashed into highly objectionable passages. For example, for a page or two Rohr commends hugging puppies and children, and even my contracted heart that wants to go it alone found itself strangely warming. But the next line says of these cuddly friends that “they are, for a moment—forgive me—God! Or is it the other way around? Is it you who have become ‘God’ by standing in such an unresisted flow?” He concludes: “Both are true, of course.” But both are false. And my long—forgive me—review has one main point: it’s that The Divine Dance isn’t about the Father, Son, and Holy Spirit. It’s a book about an alternative spirituality of Flow, committed to a metaphysic that refuses to recognize a distinction between God and the world. It’s one long looting of the language of Trinitarian theology, with an avowed goal of using that language to teach an entirely novel doctrine. I would oppose the doctrine of Divine Flow in any context where it came to my attention. But for this doctrine to be marketed as the Christian doctrine of the Trinity is insupportable. This sustained misrepresentation is what makes this book a piece of false teaching in the church. I say this with some reserve, for two reasons: First, I know that many evangelicals have Richard Rohr testimonies of one kind or another, and say they have been helped by his spiritual writing. Second, I haven’t read any of his earlier books, so I’m not speaking from comprehensive research into his full position. But what I read here in The Divine Dance is very bad. At the fringes are telltale signs of universalism, rejection of the need for Christ to die to reconcile us to God, a low view of Scripture as a morally polluted text with false statements in it, and the idea that the incarnation is itself atonement with God. At the core of the book is a motivated misuse of the Trinity. The book tends toward the subversion and replacement of the Christian doctrine of the triune God. It’s a theological Trojan horse designed to bring a hostile metaphysic into the heart of the church. If you can’t trust a teacher with the Christian doctrine of God, you can’t trust him, period. If you’ve benefited from the spiritual teaching in Rohr’s earlier books, take a moment to consider afresh whether you ought to place yourself under the teaching of such a person. My advice is that you should not. Thank God that you were stimulated to something good by his work, but acknowledge that he teaches another gospel with another God. Anything true he says can surely be found elsewhere, from a writer who doesn’t juggle the Trinity away into the Divine Flow. If you can’t trust a teacher with the Christian doctrine of God, you can’t trust him, period. If you have friends or family using Rohr in their spiritual lives, warn them off of his material. The book has six pages of endorsements; mark the endorsers as people lacking in judgment and unqualified to commend spirituality books. This is nothing to play around with. You’re not the fourth member of the Trinity, there’s not a matrix of relationality that forms and protects the three, and this book doesn’t contain sound Christian doctrine. 1 (1) The Fathers didn’t call the Trinity a dance. Let’s say we find some poetical Church Father (Romanos the Melodist? Ephrem the Syrian?) who used dancing imagery for the Trinity. That’s still a long way from saying that the Trinity is a dance, that the is-ness of God is danceness. Just try to imagine an ancient saying that. You might find it as long ago as William Butler Yeats (who asked “how can we know the dancer from the dance?”), though I suspect it made its way into modern Trinity devotionals through some more proximate source. “Maniac,” from the soundtrack of 1983’s Flashdance, would be about the right era. (2) Church Fathers weren’t talking about dancing when they used the word “perichoresis,” which (3) isn’t the origin of our word “choreography” (that would be choreuo, not choreo). Is it a bit pedantic to point out that Rohr is guilty of spreading etymological urban legends? Probably so. But shouldn’t somebody on his team have checked the patristics equivalent of Snopes.com before swallowing this myth and putting DIVINE DANCE on the cover? The fact nobody bothered is symptomatic of the whole project’s chronic sloppiness, which shows up in what it says about art, science, philosophy, history, and biblical studies. 2 (1) Art historians don’t say this. They wouldn’t be likely to say it, because (2) the complex history of this icon’s repeated restorations, especially the 1906 and 1919 restorations, include layers and layers of paint and glaze, so there’s no way to say what Rohr’s phrase “the remaining glue on the original icon” could refer to. And (3) affixing a mirror to an icon would be so unprecedented that no historian would consider it a possibility without actual positive evidence (such as a mirror affixed to an icon, or an ancient text saying “I saw a mirror affixed to an icon”). Rohr talks like someone who knows he’s bending the truth here, saying things like “the mirror seems to have been lost over the centuries” and “one would normally not put a real mirror on the front of a holy icon. If so, it’s entirely unique and courageous.” This fabricated art-history tall tale is the kind of barstool talk you only expect to get away with if nobody at the bar has Internet access in their pocket, because the Wikipedia page on Rublev’s Trinity is more than adequate to debunk it (just look for the word “riza” and think about it for a moment). That a yarn like this made it into print doesn’t inspire confidence in the editing or publishing behind The Divine Dance.